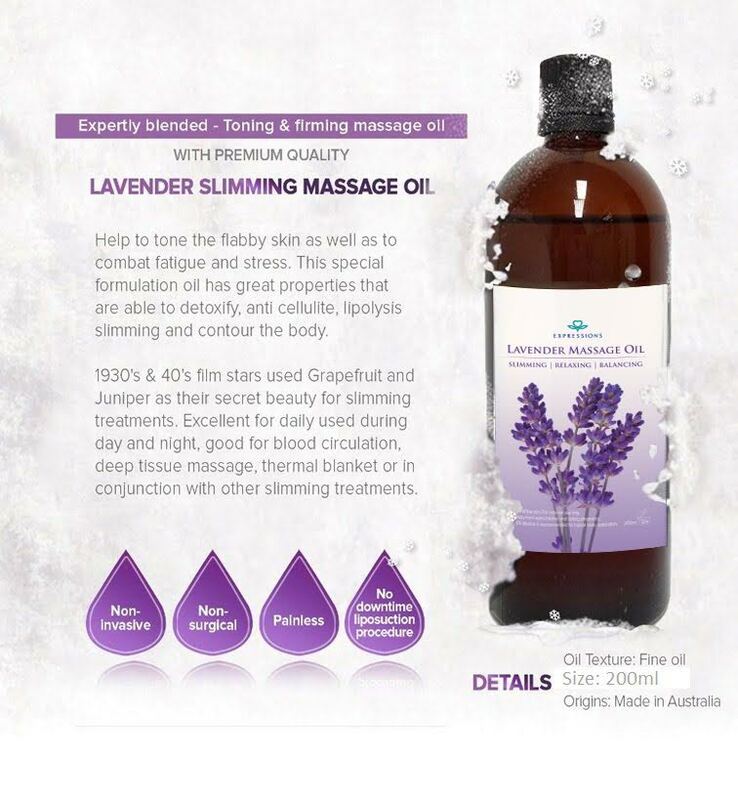 Lavender Slimming Oil contains a very potent blend of natural fruit oils. It helps to break down excess fat and stubborn cellulite build-up. This combination of oil acts as a diuretic which helps to minimize water retention in the body. This multi-function oil has incredible slimming properties which can also be used for slimming , detoxification and lymphatic massages. Excellent in enhancing the body’s blood circulation, aroma therapy and deep tissue massage. Also, thermal blanket or in conjunction with other slimming treatments. 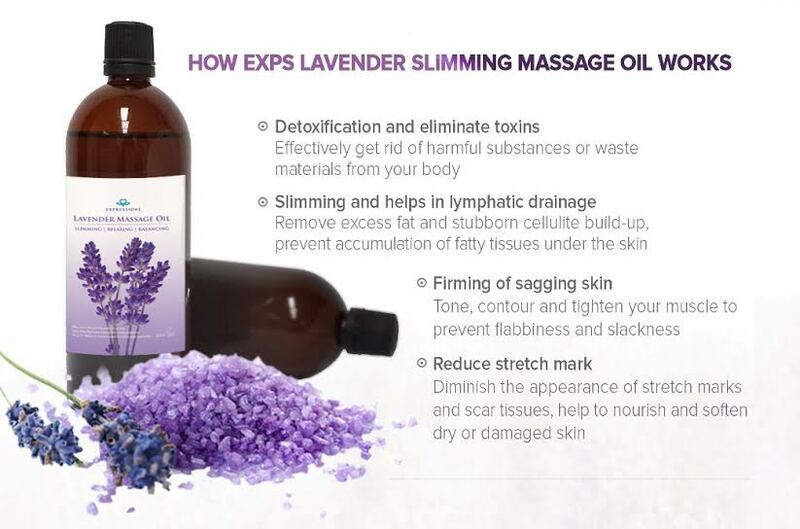 The Lavender Slimming Oil is made of natural ingredients for slimming, tightening and relaxing properties. Lemons : Helps improve blood circulation and increase metabolism rate. Grapefruits : Cleanses the body of toxins, remove water retention and also treats cellulite. Juniper Berries : Stimulates skin tissue regeneration, moisturizes, tones and tightens the skin. Oranges : Release fatty acids into the bloodstream then used for energy. 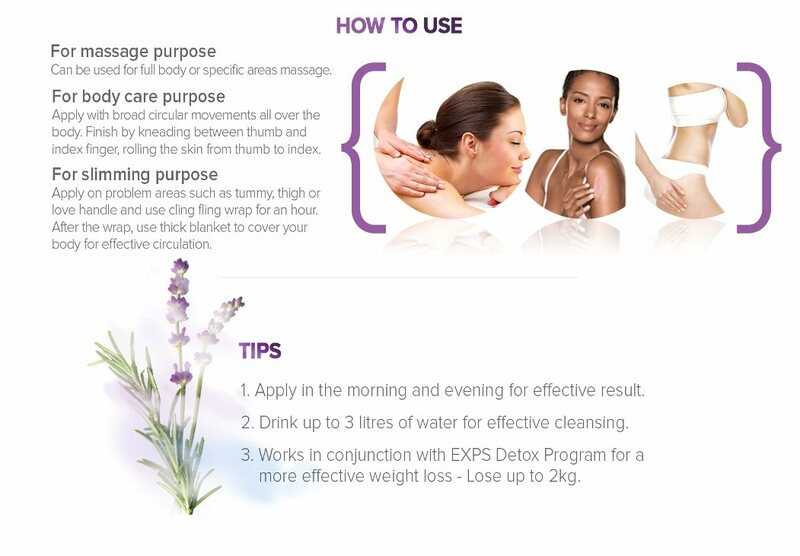 Lavender : Calming, balancing, soothing, reduces scars and stretch marks. Apply twice a day – once in the morning and once in the evening (effective results). Use on problem areas such as tummy, thighs or love handles. Wrap tightly the area for an hour and cover it with a thick blanket to increase your body temperature for effective circulation. Instead of the wrapping method you can also massage the problem area with the oil to target fat and cellulite. 100% Pure Organic Oil/Fragrant Slimming Massage/Natural Fruit/Fat Burning.Lavender Slimming Oil contains a very potent blend of natural fruit oils. It helps to break down excess fat and stubborn cellulite build-up. This combination of oil acts as a diuretic which helps to minimize water retention in the body. This multi-function oil has incredible slimming properties which can also be used for relaxing purpose and massages.